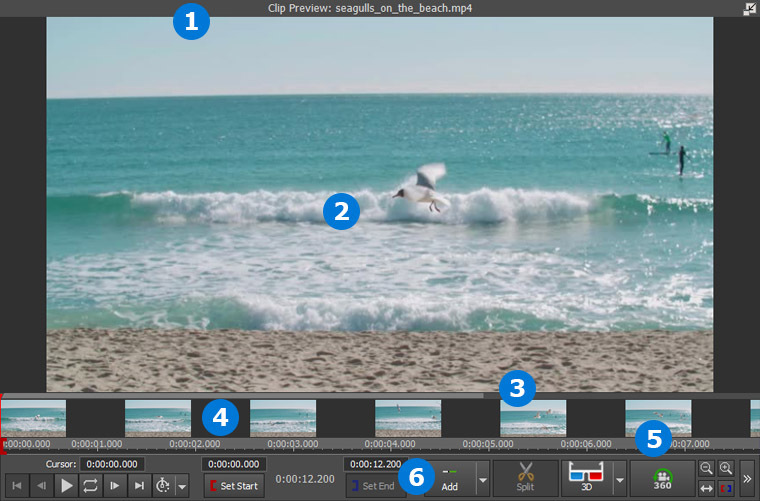 This reference guide is for both the Clip Preview pane and the Sequence Preview Pane. Note that there are differences between each pane's appearance and functionality. The Clip Preview pane is pictured below. Shows the name of the selected clip / sequence. Clips can be renamed in the clip bins only, either from the right-click menu or from the Clip menu. Shows the frame of the clip/sequence at the current playback position. Note that previews use a fixed preview resolution, which may be lower quality than the final video. Please save the sequence as a video to see the final quality. If the preview is played in a region that has not been cached yet, and frames cannot be rendered in real time, a message may be shown here in place of the preview. When checked, the previous, current, and next frames are shown side by side. Click on the previous or next frame to seek to that frame. If the selected clip is in a clip bin, this changes the frame shown in the clip bin in thumbnail view. If the selected clip is on a sequence, this changes the thumb frame shown when the sequence is in Storyboard mode. When the timeline (see below) is zoomed in, the light gray area of the view region represents the region of the clip / sequence which is visible in the timeline. Click in the view region to seek to that position in the clip or sequence. Dragging the current position will scroll the view region. A thumbnail shows a frame relative to its location in the clip / sequence. The vertical red line shows the current position in the clip / sequence. Left click in the timeline to seek to that position. Click the Zoom In / Out buttons (below) to change how much of the clip/sequence is visible on the timeline. The Start and End Time of the clip / sequence are shown with red and blue triangles respectively. As the preview cache is created, the timeline will fill green to show progress. Play, pause, seek to the previous or next frame, or go the start or end of the clip / sequence. Click on the Edit button to show title clip settings popup window. Click outside the popup window to dismiss the Edit window. The text that is rendered to the frame when this clip is visible. Note: Text clips on a sequence will use the same text as the corresponding clip in the bins. Click to select the blank clip's fill color. Note: Blank clips on a sequence will use the same color as the corresponding clip in the bins. Displays the current position of the cursor. Click to seek to a specified position. Used to trim clips / sequences. Click to set a new Start or End time. Click to change the duration of the clip. Click to change the animation duration of the clip. Select the dropdown to switch what is displayed for track clips, or click the button to cycle through the options. Clip Only - Display just the track clip. Clip + Background - Display the track clip and all clips below it in the sequence. Sequence - Display all tracks, even if they cover the selected track. Adds a clip from a clip bin to the current sequence. Note: This control is only available if the selected clip is in a clip bin. When you click the dropdown menu, you will be presented with several stereoscopic layouts that images and video are commonly arranged by to preserve left and right eye information. Selecting one of these options will reload the clip preview to show one frame (left or right) from the source that you are trying to preview, allowing it to be viewed correctly. Toggling this button On and Off, Enables and Disables the view's 360 degree preview mode. While this mode is enabled, click and drag the mouse cursor wihin the preview window to change the view's rotation angle. Split a clip at the current position on the current sequence into multiple clips. Can operate on selected clip(s), all video clips, all audio clips, or all clips. Unlinks or Re-links a pair of Audio and Video clips. Saves the frame from the current preview position to an image file, and adds it to the Images clip bin. When you click the dropdown menu, a prompt will appear asking you for the resolution at which to capture the snapshot. More information about the available resolution options can be found at http://www.nch.com.au/kb/10231.html. Adds a new clip to the clip bin with the same media, start / end time, effects, etc., as the selected clip / sequence. Changes how much of the clip/sequence is visible on the timeline. Zoom in for more accuracy when seeking, placing start / end time, etc. Zoom out to see more of the clip / sequence in the timeline. This button allows you to launch a full screen preview of the clip or sequence preview windows.